I will be the first to admit that I don’t do justice to German wines. I know that many of them are great, and I love Riesling, but I just never drink many German examples of it. Part of the reason is laziness: If you think there are lots of complications to master in Italian or French wine, learning German wines is the real task: hic opus, hic labor est, as the Sybil warned Aeneas before he entered the underworld. 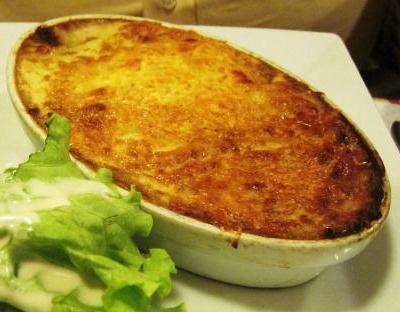 But the greater reason is that most German wines don’t match too well with the foods I usually eat. 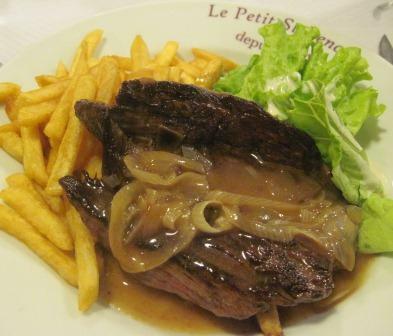 Those want red wines and bigger whites – more force, less delicacy, and less sweetness. Having said all that, I have to admit also that I am occasionally surprised by how unexpectedly well German wines can partner with unusual dishes – at least with dishes not in my regular repertory. 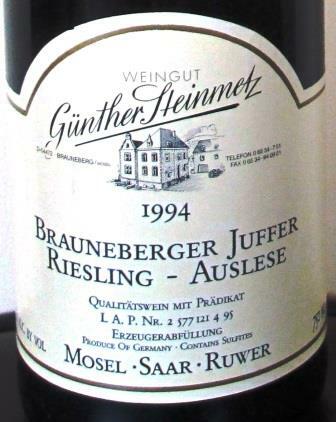 Case in point: a 1994 Gunther Steinmetz Brauneberger Juffer Riesling Auslese – all 15 syllables and every luscious drop of it – matched with a Madhur Jaffrey recipe for Sri Lankan Fish Curry, a complex dish of many flavors – fennel seeds, mustard seeds, curry leaves, turmeric, red onions, garlic, tomato, and coconut milk, not to mention a firm-fleshed blackfish filet at the heart of it all. Not my usual fare, and not my usual tipple, but they worked splendidly together. Our friends Bruce and Joan had us over for dinner. Joan has become an appassionata of Indian cookery and she particularly likes Madhur Jaffrey’s way with spices, so the dinner featured a succession of simple, top-quality primary ingredients enhanced by lively chutneys and sauces. We held the venerable Mosel for the main course. The wine opened sweet on the palate, its mature apricot and dried peach notes picking up and playing happily with the rich herbal flavors and the coconut sweetness of the sauce. 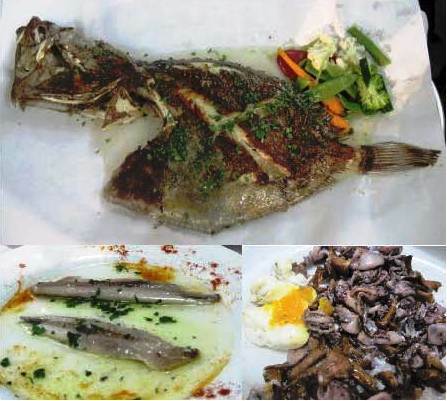 Then, as the wine’s acidity asserted itself and it became progressively drier (the finish was completely dry), the emphasis shifted to Riesling and fish, in another and different harmony. 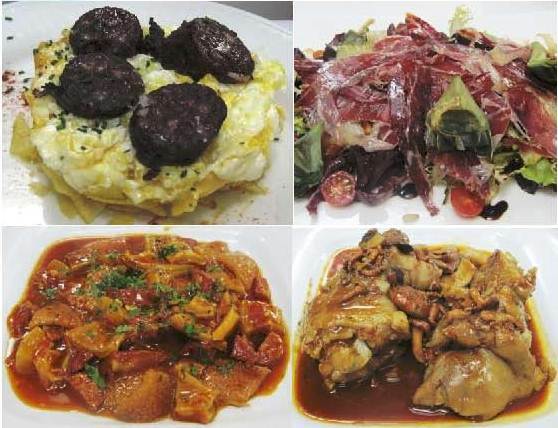 The whole interplay of the wine and the food revealed a depth and complexity that was more than a little surprising. All in all, fascinating and delicious, and all the more impressive in a 24-year-old wine from a not-world-famous producer in a not-particularly-distinguished denomination on the Mosel, itself supposedly a source of lighter wines of a certain fragility. Like almost all Mosel vineyards, Brauneberger Juffer is picturesque and dramatic, and so precipitous that working it should be considered a heroic undertaking. Brauneberg these days isn’t one of the Mosel’s magic names, though in the 19th century it was very highly esteemed. 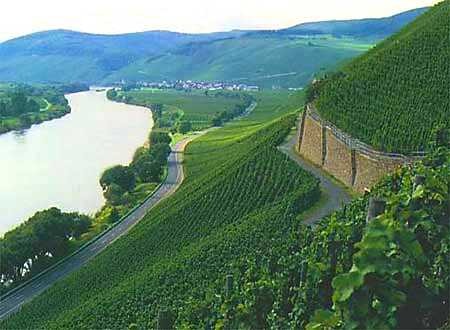 Now it is overshadowed by other sites on the middle Mosel, places such as Piesport, Bernkastel, Wehlen, and Graach. And Gunther Steinmetz is a small family winery, not a famous old ancestral property. Patriarch Gunther some years ago turned the works over to his son Stefan, who has assiduously been raising its profile. Still: The Juffer vineyard is hardly the Clos de Vougeot of Germany – all of which makes the quality and vivacity of this 22 year-old-Riesling especially striking. Clearly, I’m just going to have to make a greater effort to learn German wine – and maybe to vary my usual diet a bit. 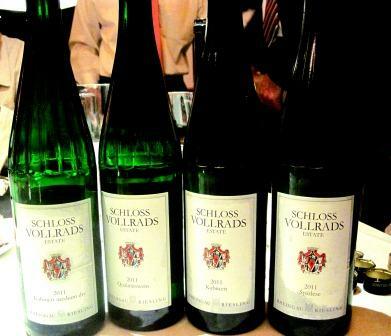 As well as being one of the most prestigious vineyards in Germany – one of three that have their own appellation – Schloss Vollrads may be the oldest identifiable vineyard on earth. At least, it’s the one with the longest verifiable history as a producing vineyard. 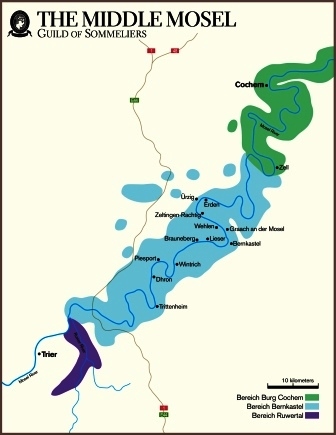 The Greiffenclau family took possession of the property in 1097; the earliest surviving record of wine sales dates from 1211, over 800 years ago. Just for perspective: That’s four years before the Magna Carta. The once-fortified tower for which the estate is named was built in 1330 on the foundations of a Roman fort dating from before the fourth century. The whole German system of wine appellations has its roots at Schloss Vollrads, which was the first to designate a wine suitable for aging as “Kabinett.” Only Pompeii can boast identifiable vineyards pre-dating Schloss Vollrads’s, and their producing history was dramatically interrupted for 1900 years. 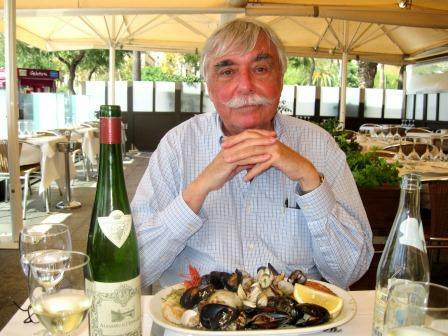 Being a sort of history nut as well as a wine nut, I happily accepted the offer to taste some of Schloss Vollrads’s recent wines over a lunch at Shun Lee Palace, near Lincoln Center. The Schloss produces nothing but Riesling, in all its German gradations of dryness and sweetness, and I’ve always found that Riesling of almost any kind matches well with Chinese cuisine. So this was a Trifecta for me, and I looked forward to the lunch with what the pulp writers call “keen anticipation.” The wines didn’t disappoint. 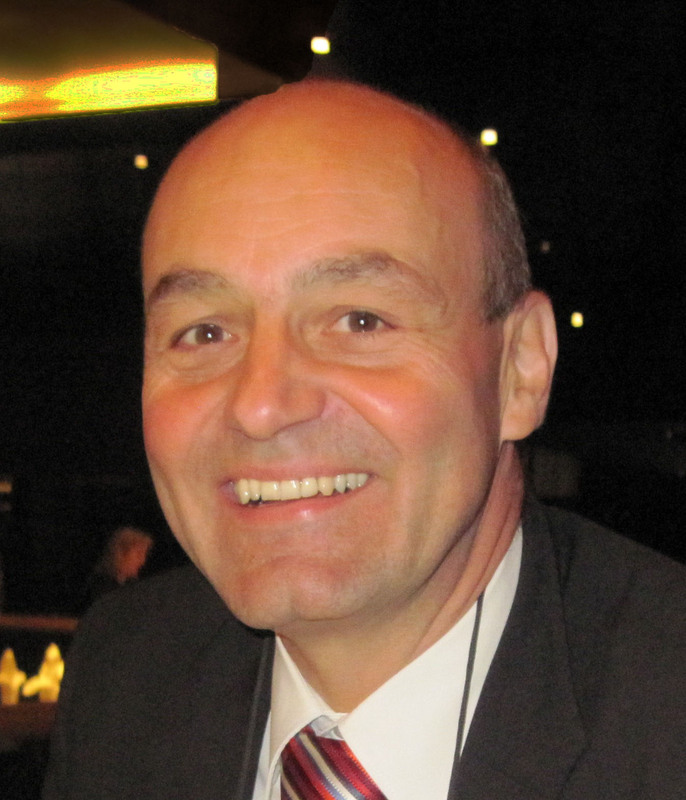 Rowald Hepp, the general manager and winemaker, represented Schloss Vollrads. Charming and knowledgeable, he has been running the estate since 1999. For centuries, the Schloss had been the heritage of the Greiffenclau family, whose last scion was Count Erwein Matuschka Greiffenclau. He was an imposing man – 6’5’ tall, gracious, and a notoriously fast driver – who loved the vineyards and their wine, but apparently was not so skilled at handling finances. When the estate was forced into bankruptcy in 1997, Matuschka walked out into the vineyards and shot himself, a gesture that in these hard (headed) financial times seems both stirringly romantic and decidedly unhelpful. 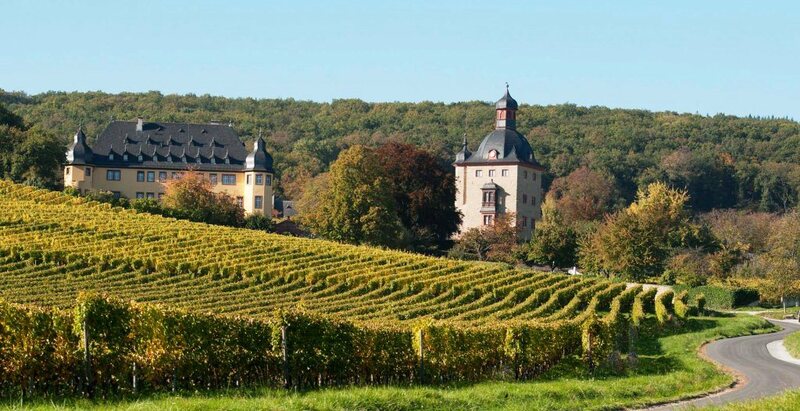 The Schloss Vollrads vineyards consist of 81 hectares of south-facing slopes along the banks of the Rhine, west of Frankfurt, in the Rheingau. They usually enjoy a long growing season, with relatively mild winters and relatively hot summers, ideal for Riesling. Field work is rigorous and precise, to control yields and maximize ripeness: removing lower portions of clusters to control molds, green harvesting, multiple hand pickings, manual sorting of individual grapes and clusters after harvest – all are routine procedures at Vollrads. 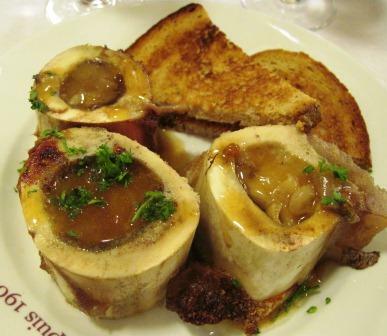 Since 2003, the estate has used no cork: bottles are sealed with glass, which, Hepp says, allows the wine to mature properly without any risk of cork taint. Here are my tasting notes on the day’s wines (with my usual caveat about all tasting notes: They were accurate for me at that one particular time and place – they may not be at all true for you, and even for me they are not engraved in stone). Riesling QbA* dry: intriguing lemon and acacia blossom aroma; great fruit and acidity; lovely long citric finish. Hepp estimates 3 to 5 years aging potential. Quite good, especially for an estate’s base wine. Riesling Kabinett medium-dry (sometimes designated “halb-trocken”): again, intense acacia blossom and lemon aromas precede an intensely floral and mineral palate with lively acidity. A trace of sweetness shows only in the slightly hazelnutty finish. Very fine. Riesling QbA: lemon/lime nose; bright and sprightly, almost frizzante, on the palate. Slightly sweet lemon in finish. Lovely Riesling character throughout. Very good. Riesling Kabinett: Small mushroom-and-earth scents mixed with flowers; floral and apricot in the mouth; great minerality in the finish. Again, excellent varietal character throughout. I would guess this wine would cellar quite well for up to ten years. Very fine. Riesling Spätlese: Fermented at very low temperatures for up to 14 weeks in stainless steel. Hepp’s technical notes are, for my palate, very accurate: “Incredible fruit complexity. Stunning floral aromas of peach, raspberry, and honeysuckle, with hints of apple blossoms and traces of ginger.” I would add that the low alcohol and the striking acidity, which easily supports the residual sugar, keep the wine light and agile on the palate, right into and through its luscious finish. Should cellar well for more than a decade. Riesling Auslese: Hepp calls this “an amazing wine”; I found it lush, rich and complex with a whole spectrum of sweet fruit flavors, all sustained by terrific acidity. I don’t have much of a sweet tooth, but I loved sipping this wine as dessert. Very fine. Over all, these 2011s all displayed that rich floral and mineral character that is the hallmark of the finest Rieslings. Their lower alcohol and varying degrees of sweetness defined them as classic German wines – wines perhaps not always easy to match with foods (but I kept thinking how much any of these wines would love a smoked trout! ), but exquisite in themselves, and when you do find their right partner, absolutely incomparable. * QbA is the basic classification of German table wines, technically a niche below Kabinett and all the rarefied levels of sweetness that ascend from there: Spätlese, Auslese, Beerenauslese (BA), and Trockenbeerenauslese (TBA).